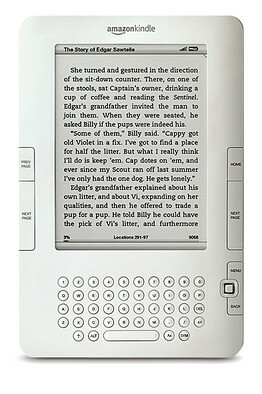 American Civil War units often copied their European counterparts. The best known were the flashy zouaves, but there were others as well, such as the chasseurs. The name means “hunter” in French, and they were light infantry, the functional equivalent of the German Jägers. Chasseurs came in both infantry (chasseurs à pied) and cavalry (chasseurs à cheval) versions. 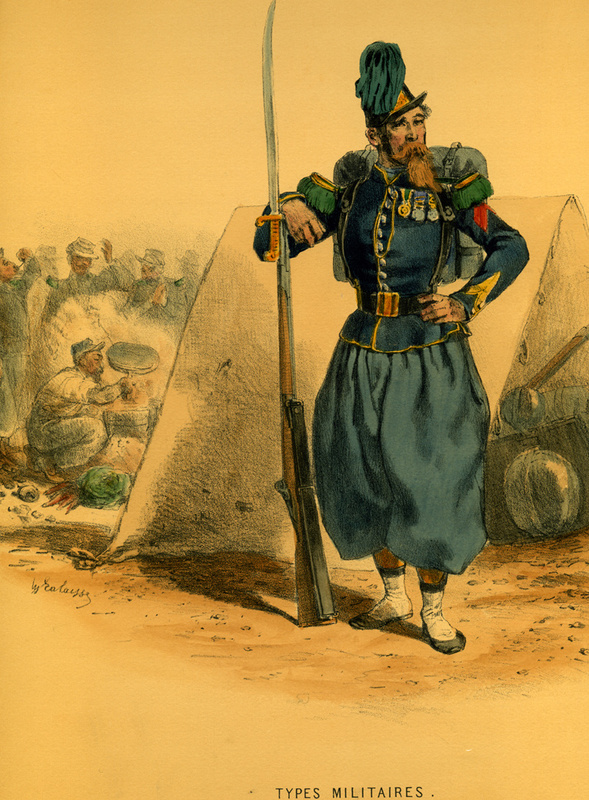 During the period of roughly 1840 to 1855 they completely revolutionized infantry tactics during their service in Algeria. 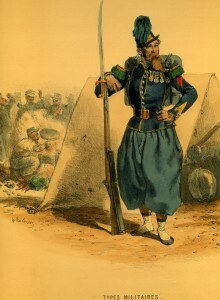 Chasseurs considered themselves elite troops and wore a distinctive outfit with baggy pants, tight blouse, and a peaked kepi. The new French light infantry system emphasized small unit tactics and individual initiative – both revolutionary concepts in 19th Century Europe (where the soldier tended to be treated as a cog in a machine), but an absolute necessity in an irregular war like Algeria. They extended the British practice of skirmishers firing by files one step further, grouping two files together into a four-man section called comrades de battaille, or comrades of battle, who were also encouraged to form strong personal bonds of friendship and mutual reliance. It also allowed them, especially with the new rifles, to keep up a steady fire while always keeping at least one weapon loaded. To control their lengthy skirmish lines the chasseurs used the bugle, and added over twenty calls to their repertoire. 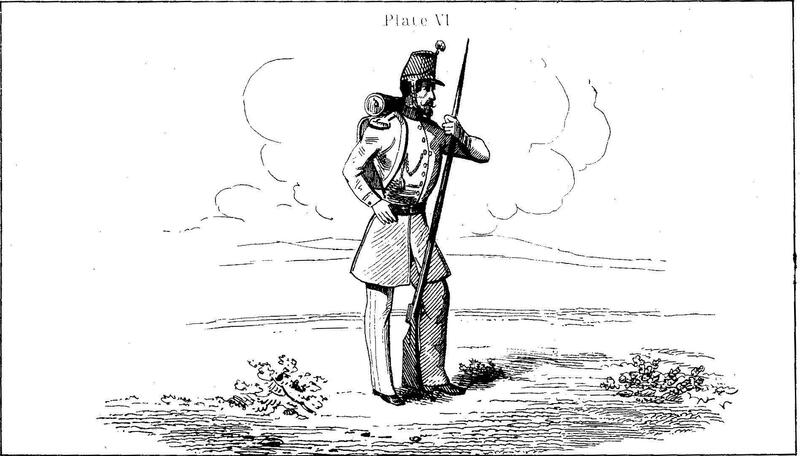 In 1845 they codified these new tactics in a manual, Ordonnance du Roi sur l’exercise et les manoeuvres des bataillions de chasseurs à pied, or “Instructions for the Evolutions and Maneuvers of the Foot Chasseurs.” Ten years later American lieutenant colonel (and future Confederate general) William J. Hardee translated this manual into English at the behest of then-Secretary of War Jefferson Davis to replace the existing tome written by General Winfield Scott. The War Department adopted Rifle and Light Infantry Tactics (later simply called Tactics) on March 29th, 1855. This drill book, essentially a word for word translation of the French, would be the standard tactical reference for both sides during the Civil War. 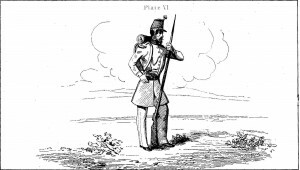 The French also continued to refine their “scientific method” of riflery with a demanding four month course of instruction at Vincennes, and published an influential manual on the subject, Instruction sur le tir (Instructions on firing), that was in due course translated by US Army Captain (and also future Confederate general) Henry Heth as A System of Target Practice in 1858. Neither Heth nor Hardee changed anything in the manuals. Even the illustrations (above, from Heth) are of French chasseurs. 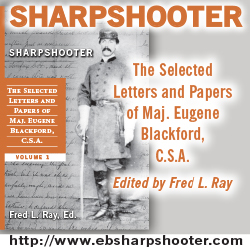 Thus chasseur tactics and rifle training were standard for both sides during the conflict. It is blue. The breeches are about three feet across the hips, tapering down to the ankle; a sort of blue monkey jacket, a large cape with a hood fastened to the back of it; one tight cloth skull cap with a tassel, and a dress parade cap which very much resembles our old patent leather cap. This cap has a plume of red, white, and blue feathers. The men of the 62nd wore these fancy uniforms around camp for awhile, then went back to regulation uniforms for field service, which seemed to be the fate of most of the chasseur suits. Is there any reference to Pennnsylvania using the same style of chasseur uniform for their volunteer cavalry units during or after the Civil War?